Since the official announcement of Xbox One X, players have pondered which titles will be enhanced effectively to have a performance at 4K. As you are most likely aware of, several Xbox One games will get free updates to exploit the additional capability of this console. One of them will be Titanfall 2 by Respawn Entertainment. From its official site, the studio detailed that the game will be optimized to run at a 4K resolution on the new console. Respawn Entertainment’s Producer Drew McCoy posted a message on the NeoGAF forums, indicating that in internal tests Titanfall 2 can render up at 3600p, a resolution that surpasses 4K and approaches 6K. There were times on Wargames last time I was testing where it was rendering at ~3200p (6K?) internally. The internal render resolution is dictated by the GPU load, so obviously there are no guarantees as to how often it renders at particular resolutions, but essentially we’re using 100% GPU all the time. However, his follow-up post tempered expectations a little. The game is just using dynamic super scaling, just like on PC. In Titanfall 2 we added dynamic resolution scaling, which can dynamically lower the resolution the game internally renders at before scaling it to fit the output resolution in order to maintain 60 hz output. We do have some parts of our render pipeline that can not be scaled internally, like our UI and post-processing (color correction, bloom, etc. ), so the output resolution actually still has to be set based on some performance cliffs we can fall off of. This is why the current console versions of Titanfall 2 don’t just output to 4K already and then let dynamic resolution scale take over – they’d constantly be scaling WAAAAY down and it’d be fugly. I tried. We do have a lower bound so that any bugs or ULTRA intense action don’t drop the resolution to 240×135 or whatever. So! Now we can scale down to maintain that sweet sweet 60 hz, and with the extra spicy temporal anti-aliasing we cooked up its actually not that bad of an IQ trade-off for the gameplay benefits of smooth framerates. What this doesn’t account for is our ability to supersample. In the shipped version of Titanfall 2 if you load it up on a PS4 Pro (which has an output resolution >1080p) on a 1080p display we’re already downsampling to fit the output resolution, providing a crisper image than you’d get with a straight 1080p output. This means you don’t need a 4K TV to see the benefits of the higher resolution output on your 1080p display. Similarly, if you plugged in your X1 or PS4 to a 720p TV you’d be getting a higher quality image than straight 720p. What dynamic supersampling does is the same as the downscaling to maintain 60 hz, but in the opposite direction. We internally render everything HIGHER than the output resolution when possible and then downsample it to fit the output resolution – much like how the PS4 Pro version looks better on a 1080p than it would if we rendered at just 1080p. The end result of this is that we can have the GPU cooking at 100% utilization regardless of action on screen since we’re scaling down and up to maintain 60 hz. All that said – Titanfall 2 running on the X1X devkit at my desk does NOT reliably run at any internal resolution. The output resolution is 4K, but its rarely sitting on just 4K. It’ll dip and rise constantly, the same way as a PC game running uncapped will never sit at just one framerate. What we’ve essentially (in theory) done is gone from a locked resolution and variable framerate, to a “locked” framerate and variable resolution. This does not mean the game is always 60 hz, as there are points in the game where we are not GPU limited (or we are GPU limited, but the lower bound isn’t low enough to maintain 60 hz – try getting a dozen Scorch Titans all throwing incendiary traps in one spot :P). In instances where we are CPU bound, we actually increase resolution until we become GPU bound. Keep that GPU pumping! None of this is new tech we’re adding to Titanfall 2 as a game. It is already present in the PC version you can play right now, we’re just getting it to work on console for the X1X launch. Someone could easily showcase the end result of this by taking screenshots of the PC game with dynamic supersampling on/off and their framerate target set really low, like 5, to ensure the scaling goes as high as possible. I do not know if it’ll make its way to other console SKUs, but it might be possible? Would be interesting to see how the PS4 Pro fares, for sure. As for the “6K” comment – given the previous explanations – I was playing some REDACTED on Wargames and happened to see the scale factor was at ~1.5X while shooting some grunts. 3840×2160 x 1.5 = 5760×3240. As I originally said – no guarantees on internal resolution at any time – but it was pretty amazing to see how high it was going. Good times. The tests were conducted in The War Games, the new free DLC for the game that will release on June 27. 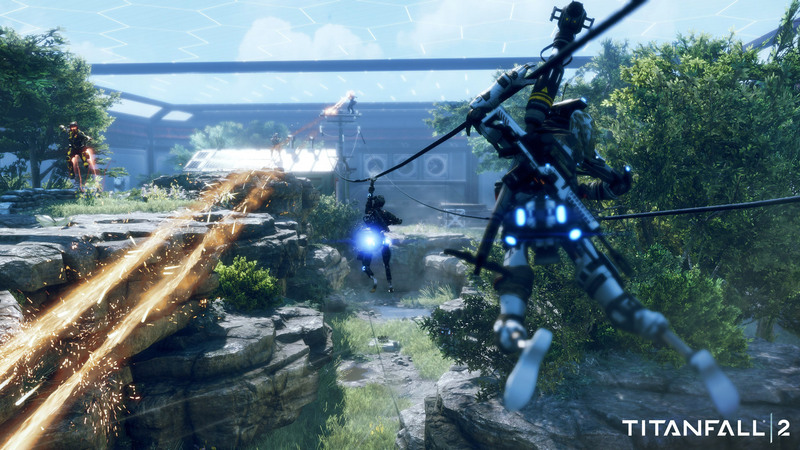 The franchise will also appear soon on mobile devices thanks to Titanfall: Assault.